Myanmar has hosted its first ever public LGBT festival to “acknowledge equality and basic human rights”. 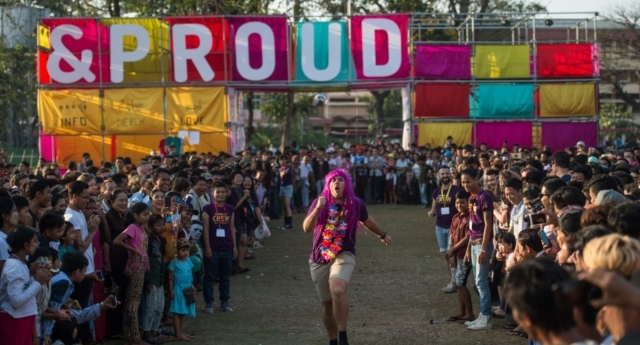 6,000 people attended &PROUD Festival at a park in Yangon on the first day to celebrate being LGBT and proud. Despite homosexual relations being illegal in the country, organisers were given permission to host it in a public space, unlike previous years where they have had to host it in a discreet garden at the French Institute. The event runs across two consecutive weekends and has activities such as a drag queen race and handbag throwing and screenings of LGBT films. It also has a “Human Library”, where LGBT people tell their personal stories as part of the festivals aim to educate and entertain. This festival being made public is a big step in the right direction for equality in Myanmar. Over the last couple of years, political reforms have made Myanmar a more accepting environment to be gay, but there is a still homophobia and discrimination against the community. In years prior, when the festival was more private only 2-3,000 people would attend overall. He was wearing in a bright pink shirt, blue contact lenses and had his hair dyed strawberry blonde. He told Channel NewsAsia: “You get people who are LGBT but they don’t know what that is. The festival will be held again in a different part of the country this year to spread awareness and organisers are going to campaign to remove laws against LGBT people. Previously, the festival has been held showcasing LGBT films, but this year is its most public appearance. Last year, Lucknow in India hosted its first pride event.